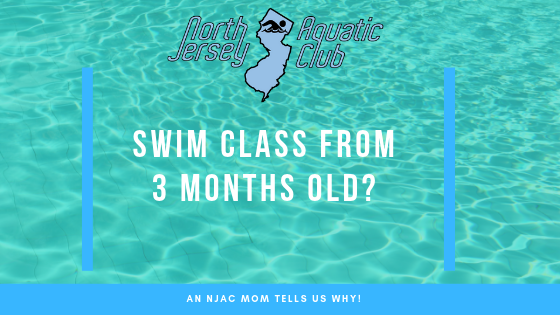 My daughter Addison started swimming with NJAC at 6 months old, I was so excited to start swimming with her and my focus was water safety and socialization. My main goal was for her to start learning water safety at a young age and for us to do something interactive together and with her “peers”. 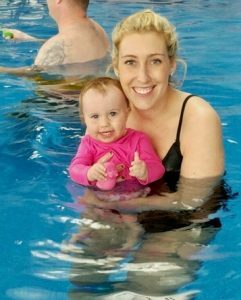 Once we started swimming, our journey began and I found so many other unexpected benefits to swim class, which exceeded my expectations. Here are few reasons why starting them young is the way to go! 1. Teaching confidence at a young age. As my daughter progressed from the parent/child class to a level 1 transition class, she was then challenged to separate from Mommy and swim with an instructor. She had to trust her instructor and have confidence in herself, without mommy holding her hand (literally) to do her jumps and floats. Between her instructor and I, we always encourage her to push her limits and cheer her on- she has progressed so much and I can tell the root of her growth is a strong confidence in her ability. When we started swimming at 6 months, Addison was meeting her milestones like sitting up and rolling over, and I had no concerns about her muscle tone or progression. Fast forward to her one year birthday, I had a child who was delayed with crawling and delayed with walking. We entered early intervention and started therapy for low muscle tone. While we had our weekly therapy sessions, I was always seeking external ways to help her strengthen. As she progressed into the Level 1 class, she began challenging herself physically to pull herself out of the water and climb out the side of the pool, to “just keep swimming” even when she was tired and work muscles in the pool kicking and scooping that she would never work as hard in regular gym activity or therapy. I know this benefit sounds obvious, but really– when I signed up with NJAC I really didn’t know what to expect this meant for a 6 month old I was quickly amazed to watch the babies float on their back (safety spot), pull themselves up on the side of the pool and “monkey walk” on the side of the pool to get to the exit. Another huge thing was learning boundaries of the pool. 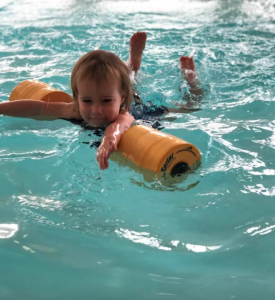 When Addison started walking, she knew that the pool was off limits unless Mommy or her instructor was in the pool, and she was given permission to enter. I had peace of mind knowing that she would not just wander off into a pool/body of water because she knows her limits in the pool. Swim class days are always looked forward to, by both Mommy and Addy. When Addison was a baby and I went in with her, it was a time to unplug, cuddle, splash and play. We sang songs, played with other babies and spent quality time together. Now as a toddler, Addison gets to enjoy my attention and pride as I watch her progress every week. 5. Meeting new parents like me! As a new Mom, I was looking forward to meeting other Moms with similar aged children. Each week, all of us in the class got to chat a little more and know each other a little better. We discussed everything from sleep patterns/eating patterns and new mom struggles. It was great to chat with other parents, observe the other babies and get advice from other Moms. 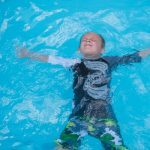 So, if you are thinking about signing up your child for a swim class- DIVE RIGHT IN! If my child will be taught to be confident at a young age through swimming lessons, I will definitely consider enrolling her in one. I like that you mentioned that it will increase her muscle tone which she can use as she grows. I’ve heard that these lessons will also teach her about water safety as well so it might be good for her in the long run. Thanks for the comment! And we hope to see your child at swim soon!